Vinyasa. The synchronization of breath and movement. For each posture there is a vinyasa, a specific method for entering and exiting the posture, with each movement accompanied by either an inhale or an exhale. This coordination of breath and continuous movement purifies the body as it builds internal heat, eliminating toxins released through sweat, and adds fluidity to the practice. Breath. Breathing in and out through the nose, while contracting the muscles of the throat, a subtle hissing sound is made with the breath. The breath should be steady and continuous throughout asana practice, with inhalation and exhalation of equal lengths. Correct breathing increases circulation and builds internal heat, thereby helping to dispel toxins and purify the body. The breath is an essential tool which can be used to relax the body and calm the mind both in our practice and daily life. 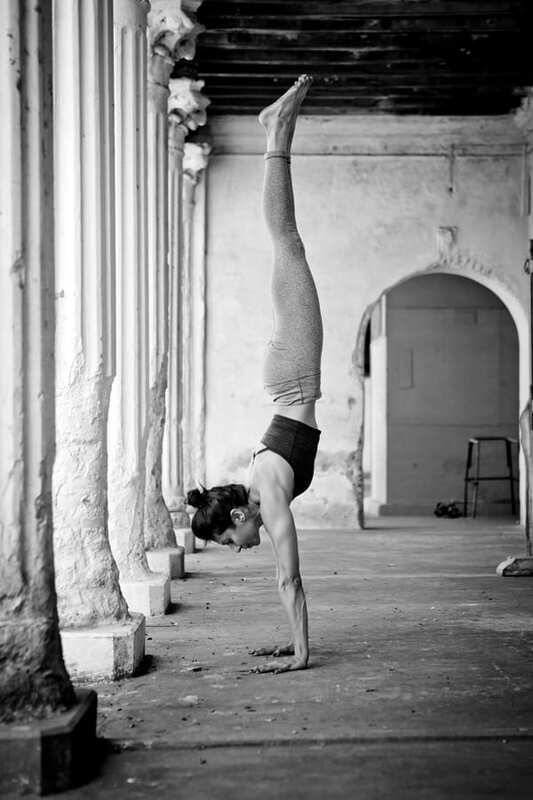 Asana. Meaning “posture”. The physical practice of asana should be done in a methodical way with correct alignment and proper guidance from a guru. An asana should be perfected before continuing on to the next one, allowing oneself time to become steady and comfortable in each posture, while building the strength, stamina and flexibility required for later postures. Too many asanas too quickly can injure the body. Our focus should be on the quality of the postures being practiced, not quantity. Drishti. The gazing point. There are nine points of drishti in the asana practice. Looking to a specific point on the body helps to align the neck and spine correctly in each posture. Drishti also helps to improve concentration and focus the mind, leading to greater calm and steadiness, and increased self-awareness in practice and daily life. Bandha. Meaning “to close” or “seal”. Bandhas are energy locks that are used in conjunction with our breath to keep energy from exiting the body, primarily through “mula bandha”, the root lock, or lifting of the pelvic floor, and “uddhiyana bandha”, the lower abdominal lock. Engagement of the bandhas throughout the practice gives strength and lightness to the body. By fixing our attention on our posture, breath and gaze, purification takes place on three levels during yoga practice: in the body, the nervous system and the mind. These three places of attention or action are referred to as tristhana. The six poisons. A key aspect of internal purification relates to the six poisons that surround the spiritual heart. In the yoga scriptures, it is said that God dwells in each of our hearts in the form of light, but this light is covered by six poisons: kama, krodha, moha, lobha, matsarya and mada. These are desire, anger, delusion, greed, envy and sloth. When yoga practice is done with the correct bhavana (thoughts and intention), and sustained with great diligence and dedication over a long period of time, the heat generated from it burns away these poisons, allowing the pure inner light of our soul to shine through.